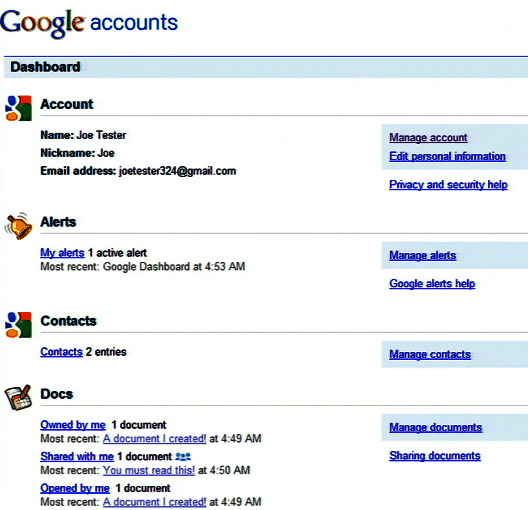 Google Dashboard is a new service that shows a summary of the data stored with a Google account. 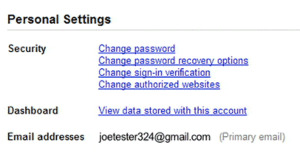 You'll soon find a link to Google Dashboard in the "personal settings" of the "my account" page. The dashboard lists some of the information associated with the Google services you use: your name, your email address, the number of contacts, the number of conversations in your Gmail inbox, your Google profile, the most recent entries from the web history etc. It's a long answer to the question: "What does Google know about me?". More information about the new service in a YouTube video that was supposed to be "embargoed until 2am PT, November 5th". Update: Google Dashboard is now available at http://www.google.com/dashboard. The video is now set as private :-). Hmm, I watched it 10 minutes before posting the message above. I've been waiting for something like this, now if only Google could support 3rd party apps in this dashboard via OpenID, OAuth and OpenSocial (that'd make my day). That's really interesting. I knew Google stored all my data, but I feel more comfortable being able to see it. I'm a Brit living in Amsterdam. Dashboard geolocates my IP and presents in Dutch. I neither speak nor read Dutch. There appears to be no option to change to English. Assuming geolocation *invariably* indicates the correct display language is a fundamental and obvious error. I also note that although the *option* to comment anonymously is provided, in fact, when trying to do so, a Dutch error which translates to "that request cannot be processed" occurs. Then, when you hit back, your original comment has been wiped. Fortunately, I have enough experience with WWW interfaces to have opened a text editor and made a copy of my text before posting. I'm sorry I had to disable anonymous comments and enable moderation, but there are many spam messages that disrupt the conversation. To switch Dashboard to English, use this URL: https://www.google.com/dashboard/?hl=en. "hl=**" works for most Google services. I'm impressed. The only two negative arguments against Google are about privacy and monopoly, this goes some way to doing something about the first. Thanks! 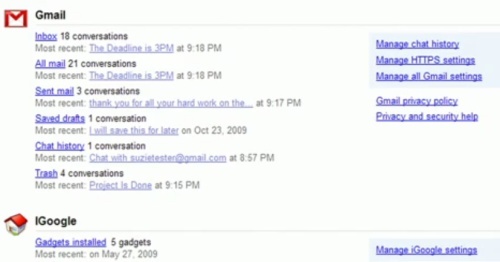 Google Dasboard (http://www.google.com/dashboard) needs Data Liberation Front(http://www.dataliberation.org/) integration. Either the Data Liberation Front should come with a special integrated Dasboard page, or the official Daspboard page should be enhanced with a link for each service that points to a description of how to remove-export your data from Google. Who whips up a greasemonkey script in the mean time? It is a great move but just also shows how much of a digital footprint that you have online with just one account. Many people have more than one account so the volumes of data is quickly multiplied. As the person who uses a lot of Google's services I really appreciate Dashboard as being the primary source of information. However, I couldn't help but think if you could make it customizable enough to add/remove certain parts. For example I don't care about Picasa pictures but I want to see AdWords and Analytics right there. I can't change language of dashboard page. it is Dutch and there is no option to change language. Google Dashboard asks to enter password and then goes into permanent loop in Chrome (too many redirects). once again google is gr8......!!!! No, it doesn't require a Gmail account, only a Google account. How do I change the language? I'm in London, but my web traffic is routed over a corporate WAN via Frankfurt, so the page appears for me in German. Such an obvious error!!! Can anyone help me change my language to English? as my dashboard is currently shown in the local language. I have only one word for Google Dashboard...POWERFUL...I'm already using it and wow it's really great..helps me get organize..to do list..notes..you'll love it for sure. Yeah ! new service now works fine. This is really good tool which easier the life.